The extent of continental rifts and subduction zones through deep geological time provides insights into the mechanisms behind supercontinent cycles and the long term evolution of the mantle. However, previous compilations have stopped short of mapping the locations of rifts and subduction zones continuously since the Neoproterozoic and within a self-consistent plate kinematic framework. Using recently published plate models with continuously closing boundaries for the Neoproterozoic and Phanerozoic, we estimate how rift and pericontinental subduction length vary from 1 Ga to present and test hypotheses pertaining to the supercontinent cycle and supercontinent breakup. 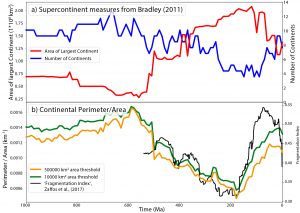 We extract measures of continental perimeter-to-area ratio as a proxy for the existence of a supercontinent, where during times of supercontinent existence the perimeter-to-area ratio should be low, and during assembly and dispersal it should be high. The amalgamation of Gondwana is clearly represented by changes in the length of peri-continental subduction and the breakup of Rodinia and Pangea by changes in rift lengths. The assembly of Pangea is not clearly defined using plate boundary lengths, likely because its formation resulted from the collision of only two large continents. Instead the assembly of Gondwana (ca. 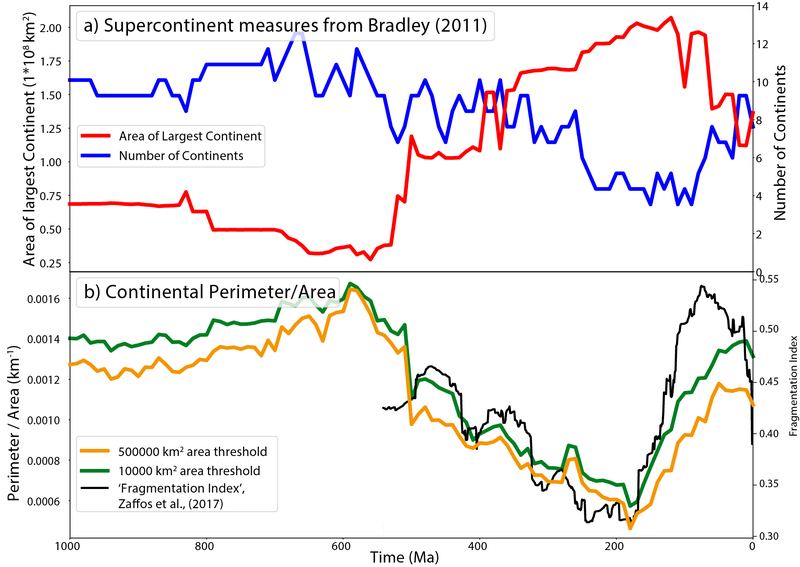 520 Ma) marks the most prominent change in arc length and perimeter-to-area ratio during the last billion years suggesting that Gondwana during the Early Palaeozoic could explicitly be considered part of a Phanerozoic supercontinent. Consequently, the traditional understanding of the supercontinent cycle, in terms of supercontinent existence for short periods of time before dispersal and re-accretion, may be inadequate to fully describe the cycle. Instead, either a two-stage supercontinent cycle could be a more appropriate concept, or alternatively the time period of 1 to 0 Ga has to be considered as being dominated by supercontinent existence, with brief periods of dispersal and amalgamation.